The death of a pet is a heartbreaking thing to go through, but usually just for the owner. Or, at least, people who knew the pet. The tributes to Paris Hilton’s dog, Tinkerbell, that have shown up on Twitter today are a little over the top. The fashion designer and reality star posted to her Instagram Tuesday afternoon to share the news that her beloved Chihuahua, who had been by Hilton’s side since The Simple Life, had passed away. Tinkerbell was the dog who started the dogs-as-accessories trend. She was tucked into Hilton’s purse on red carpets and resting on Hilton’s arm as she walked Hollywood. She made frequent appearances on Hilton’s TV shows and social media accounts. She was loved by Hilton’s fans, for sure. 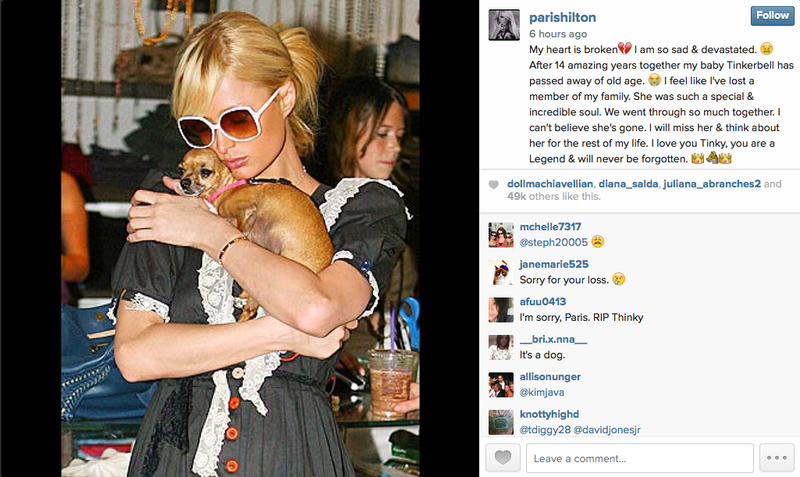 Despite being a little weirded out by the intensity of Paris Hilton’s fans, we sincerely wish the best for the heiress as she mourns the passing of her longtime pet. Rest in peace, Tinkerbell! Do you think Paris Hilton’s fans’ reactions to the news about Tinkerbell are justified? Or do you think they’re taking their mourning too far? We’d love to hear what you think — head down to the comments and let us know!